The French authorities will publish a letter by President Emmanuel Macron on 14 January in order to encourage people to participate in a great national debate, slated to begin on 15 January, AFP reported. Macron is expected to launch a three-month national debate to quell the violence displayed in the recent “yellow vests” protests against government policies. The debate will focus on four main topics such as taxes, purchasing power, democracy and ecology, and is expected to be held in town halls and on the internet. However, some are already questioning the method of stopping the unrest: for instance, AFP cited a 59-year-old French man who said that “the debate is in the street, not in a hall, or on the internet. It is now that we need to discuss. I don’t think any good will come out of this”. TWEET: “Macron’s resignation is the only way to appease France”. La démission de Macron est la seule option pour apaiser la France. TWEET: “The Great debate? The biggest bluff in two years MACRON”. French politician Nicolas Dupont-Aignan also blasted the idea, saying that “the great national debate is complete nonsense, there is not a single French person who believes in this comedy. The Great Debate is great blah!" President of the Democratic Movement François Bayrou, for his part, said on Saturday that the debate could be “very important and beneficial” for French society, “even though many will try to hamper” the discussion. This weekend’s protests were marked by an increase in the number of protesters taking to the streets of France, with an estimated 84,000 people demonstrating nationwide. 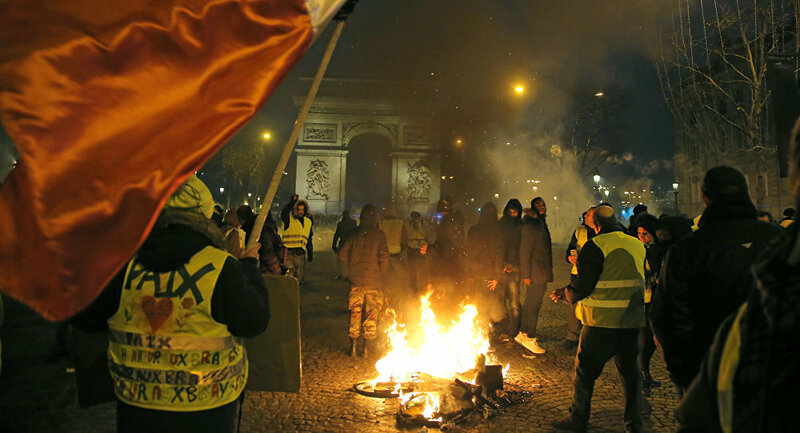 Demonstrators called for Macron’s resignation, with sporadic violence erupting in Paris, Marseille, Toulouse, Bourges, and several other cities. Police used tear gas, water cannons and flash-balls in the French capital to push back some protesters hurling rocks, bottles, and improvised projectiles at officers. The “yellow vests” protests, which take their name from the jackets French drivers usually wear, have been raging across France since mid-November, initially starting as demonstrations against fuel tax increases. Although the French authorities abandoned their plans, the protests have since mushroomed into a broader movement against government policies.